Jake Perry and Jaysa Bobrowski have a sled in tow, a saw in hand, and they're walking through a field, passing row after row of pine and fir trees. "We just bought a house together, so we're starting a tradition," Bobrowski said. A few minutes into their walk, they find a good-looking balsam fir. The two just moved into together in White Bear Lake and want a smaller tree. "My family used to do this every year, my folks still do it," Perry said. "Last year, she really wanted to (cut a tree) and time didn't make that happen, so we went to Home Depot. So this year we wanted to cut a tree down and I want to carry on the family tradition and start our tradition." There were hundreds of people like them at Krueger's - people starting or carrying on the tradition of cutting down their own tree. Standing in the middle of all of it is John Krueger. 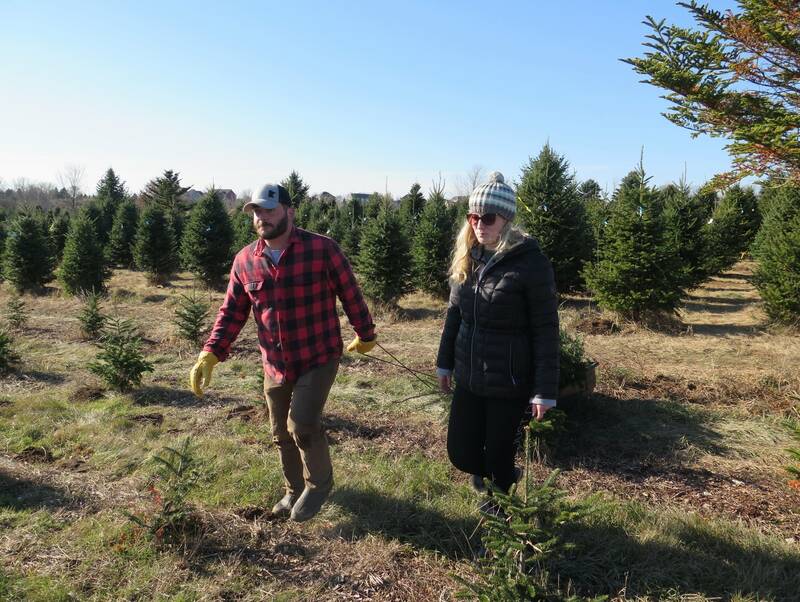 He's the third generation to run the farm - his parents are still heavily involved - and today he's overseeing the end of the line for the trees. "This is our busiest weekend of the year," he said. "Typically people have their Thanksgiving holiday and then their starting to think Christmas trees right away. In the past it's been the weekend after Thanksgiving that's been most but, but lately its been this weekend immediately after Thanksgiving." 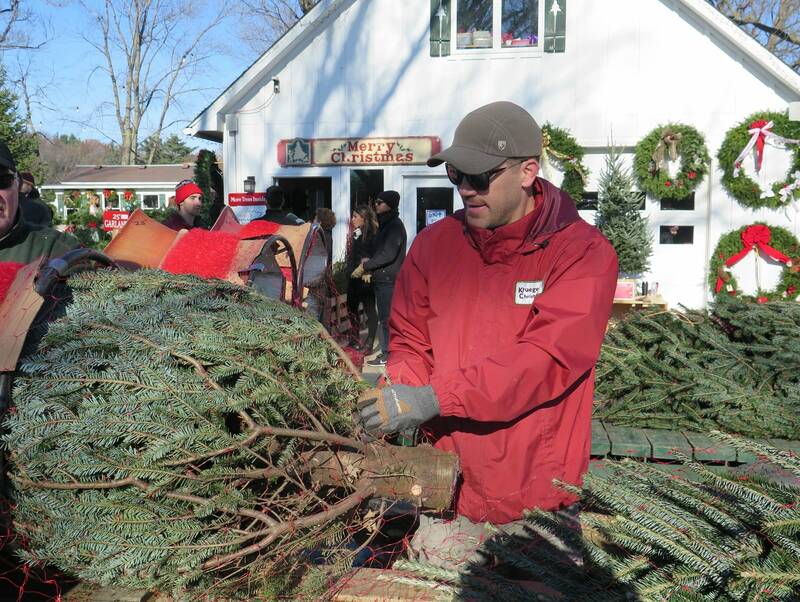 Customers line up with their freshly cut trees or trees picked off the racks. 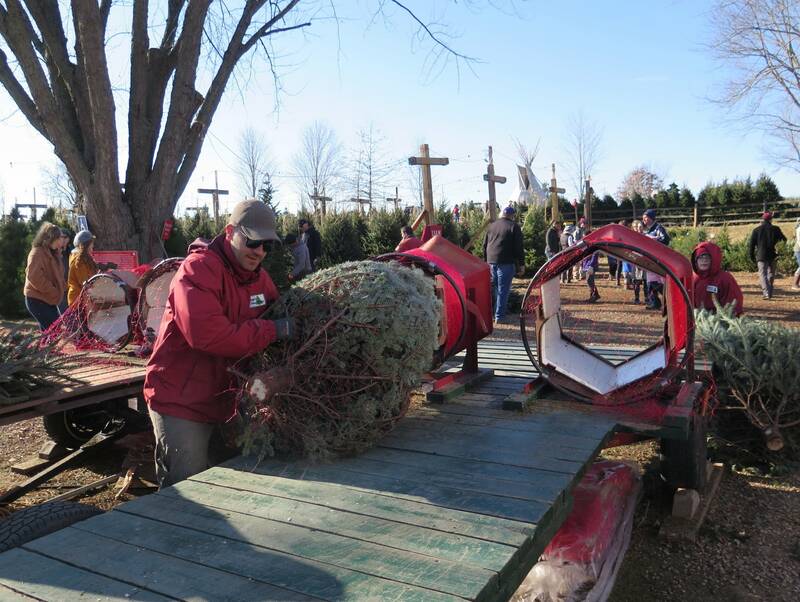 At the front of the line, Krueger grabs the trees, cuts off the lowest twigs and puts the tree onto a machine that shakes loose all the dead pine needles and other detritus. He says there's not one perfect kind tree for every person or home. "It's kind of like art, everybody has their own definition of what a good tree is," he said. "We try to cater to all different folks, we have some trees that we sheer tighter, so that they are more dense and fuller if you will. Whereas others are less sheered and more are open natural. So those open, natural ones often have the most character and customers are tending to go towards that. They're also easier to decorate because they have fewer branches on them." The trees are then put through a chute where the tree is pulled through and wrapped in mesh. Another worker saws off the bottom. In a few minutes, the customers are lined up in their cars, and workers use long strips of twine to tie the trees onto cars and send people on their way. Neil Krueger, John's father, said his farm has 50 acres, and they harvest a couple of thousand trees each year. He said it takes between nine to ten years for each crop. "We wouldn't do it if we didn't enjoy it," he said. "It's a hobby that's turned into a business, but it is a lifestyle. We're involved in planting, harvesting and tending to the trees year round." Jake Perry and Jaysa Bobrowski put their tree onto a sled and headed toward the check out. Bobrowski read off the price tag and the measurements - $69 for a six and a half foot tree. "The price you pay for happiness," Perry said dryly. "But the memories...priceless."